The resources below are a selected list of historical resources on the Stanwood & Camano Island area, including small communities of Cedarhome, Florence, Silvana, Warm Beach, Milltown, Victoria, Village, Woodland and the former East Stanwood. These resources are intended to cover general aspects of frontier and pioneer life and settlement. Today this area covers the Stanwood Camano School District in northwest Snohomish County and Camano Island, in Island County. To focus on specific aspects of early life, check the library for historic resources on logging, steamboats, schools, railroads, in Puget Sound, Washington State and the Pacific Northwest. For genealogy help see the Camwood Obituary Project provided by the Camwood Genealogy Workshop group. It meets the First Monday of the month at SAHS museum, 2nd floor. Bruseth, Nels, Indian stories and legends of the Stillaguamish, Sauks and allied tribes . Fairfield Washington, Ye Galleon Press, 1977 (reprint of earlier 1950 publication). Buse, Penny Hutchison. Stuck in the Mud: The History of Warm Beach, Washington. Snohomish, WA: Snohomish Publishing Co, 2011. David M. Buerge and Peter Henning. The Builder: The Life of Peter Henning, 1868-1955. 2003. Includes history of East Stanwood. David M Buerge and Peter Henning “The Son: Peter Henning Jr.” more history of farms, family and career of physicist, Peter Henning, Jr.
Cameron, David, et. al. Snohomish County / An Illustrated History Kelcema Books, Index, WA 2005. A welcome new updated history of all of Snohomish County including the pre-history and Native American language and culture. Covers “new” history of suburban era of Mountlake Terrace and Mill Creek and Lynnwood as well as older communities of Stanwood, Mukilteo and Snohomish. Cook , Jimmie Jean. “A particular friend, Penn’s Cove”; history of the settlers, claims and buildings of central Whidbey Island. Coupeville, Wash., Island County Historical Society,  Contains many references to Stanwood/Camano historic connection to Coupeville. See pp. 38, 64-66, 75-76, 133. Essex, Alice The Stanwood Story, Stanwood, WA., Stanwood/Camano News. A chronological and pictorial history of the Stanwood area, including Camano Island, . Volumes 1 and 2 were written by Alice Essex, the third was written by Mrs. Essex and completed by Cliff Danielson, former publisher of the Stanwood News. Alice Essex was the daughter of D. G. Bennie, an early day pioneer logger and mill manager. There is an index for the three volumes available at the Stanwood Area Historical Society and the in Local History Reference at the Stanwood branch of the Sno-Isle Libraries. Hawes, E.M and Lou Clark. Island County – A World Beater , [1911 or 1913] F. B Hawes Co., Everett Wash. Promotional booklet Reprinted by Frayn Print. Co, 1968. and the South Whidbey Historical Society, Langley, WA about communities in Island County. It can be found online at the University of Washingtons Digital Collections Washington State Pioneer Life Database . Kellogg, George Albert, A history of Whidbey’s Island (Whidby Island) State of Washington. Whidby Island. [n.p., Island County Historical Society] 1934. Kimball, Art and John Dean. Camano Island : life and times in island paradise [Stanwood, Wash.?] : A. Kimball, 1994. Mattson, John Lyle. A Contribution to Skagit Prehistory / A thesis submited in partial fulfillment of the requirements for the degree of Master of Arts. Washington State Department of Anthropology, 1971. Neil, Dorothy. By canoe and sailing ship they came / edited and compiled by Lee Brainard. Oak Harbor, Wash. : Spindrift Publishing, c1989. Osmundson, John Skinner, Man and his natural environment on Camano Island, A thesis submitted in partial fulfillment of the requirements for the degree of Master of Arts in Anthropology, Washington State University, 1964. This is the most complete resource on Native American life on Camano Island and includes many dates and and details about various eras of Camano history. 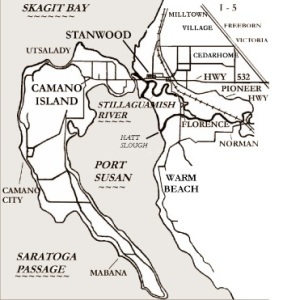 Osmundson, John, “Camano Island – Succession of Occupation from Pre-Historic to Present Time” The Washington Archaeologist Vol. V, no. 4 April 1961, pp 2-18. Prasse, Karen. Camano Island. Images of America. Charleston, SC: Arcadia Pub, 2006. Over 200 photographs of Camano Island and its logging, sawmill agricultural and resort history. Available from SAHS and local bookstores. Suttles, Wayne and Barbara Lane. “Southern Coast Salish” Handbook of North American Indians, Washington D. C. Smithsonian Institution, 1978-1990. v. 7, pp. 485-502. White, Richard. Land use, environment, and social change : the shaping of Island County, Washington / Rev. ed. Seattle : University of Washington Press, 1992. Very comprehensive account of land use, ecological and economic changes in Island County. Extensive bibliography. Whitfield, William. History of Snohomish County, Washington, vols. I & II. Chicago : Pioneer Historical Pub. Co., 1926. Contains references to early Utsalady history as well as Stanwood area history, though some information is contradictory to other sources. Conroy, Dennis. “The Utsalady Sawmill.” Tall Timbers Short lines, Issue no. 65, Spring 2001, p.9 – 22. Various articles published in the newsletter Stanwood Area Echoes covering topics relating to resorts, logging, diking, log jams, agriculture, historic places, and people. There is an index for available at the Stanwood Area Historical Society and the in Local History Reference at the Stanwood branch of the Sno-Isle Libraries. Local Newspaper Holdings – Back issues for obituaries, dates, business & organization histories, events, etc. Please let us know if this information is incorrect or you have copies that might fill in our missing holdings. Disclaimer: Microfilmed reels done in the 1980’s newspaper microfilming project are available as listed, there are many missing issues. Also the many name changes confuse things. There are no indexes of these papers. It is possible to use the Stanwood Story to get a date range to search through issues. Stillaguamish Times, 1889 -1890?, moved to Haller City / Arlington. Stanwood Post, 1890-1895: sporadically published with different publishers. Only existing issues known are one fragment published in 1891. Stanwood Tidings, 1903 – 1917: Microfilm available at Sno-Isle Libraries Marysville Branch, WSL, EPL (Snohomish County Misc Reel #1) and SVGS; scattered issues at SAHS. Stanwood News, 1920 – 1930 Microfilm (1923-1978) at UW, WSL, SVGS; scattered issues at SAHS and SCNEWs and Sno-Isle Libraries Marysville Branch where there is a digital microfilm reader that can save images from the microfilm on to a USB or other storage device. Twin City News, about 1930 – 1959: Microfilm UW, WSL, SVGS, Sno-Isle Libraries Marysville Branch; scattered paper issues at SAHS, and SCNEWs. Stanwood News, 1960-1980: Microfilm WSL, SVGS, UW. Stanwood / Camano NEWS, 1981 – 2009. Microfilm (1923-1980) Sno-Isle, WSL, SVGS, UW. Bound volumes are at available at SAHS. the Stanwood Public Library (1970:Jan.1-1973:Dec.26 ; 1976:Jan.7-1980:Dec.31 BOUND), and SCNEWs. Obituaries are also collected by the Camwood Genealogy Workshop held at the SAHS Museum. Camano Enterprise, 1908-1909 – a few issues of this newspaper published at Camano [City] on Saratoga Passage at SAHS. East Stanwood Bulletin, 1914 – 1916 (a prohibitionist paper) : WSL, scattered issues at SAHS. Camano Island Sun: 1980 – 1982. A few issues at SAHS – sort of a neighborhood weekly. Merged with Stanwood News. For Camano history, microfilm of the Island County Times is also helpful and available at UW. WSL= Washington State Library; – may request reels through interlibrary loan from Sno-Isle Regional Library. Plat book of Snohomish County, Washington / “compiled and published from actual surveys and the county records by Anderson Map Company”; Seattle, Wash. : Anderson Map Co., 1910. S hows structures, property owners, plats and homesteads of early Snohomish County. Copies of original located at the Everett Public Library Northwest Room and at SAHS. Digitized Sanborn Maps, 1867 – 1970 includes Stanwood ( & Everett and some other Snohomish County towns ). Everett Public Library Northwest Room also has copies (Microfilm only). These historical maps show the past structural foot prints and layouts of the towns for insurance purposes. They are now used by local historians, planners, geographers, genealogists to document community and social history. Some of our local cities still have these maps. 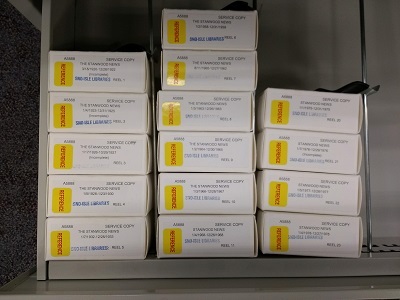 Sno-Isle Libraries used to have a subscription to the digitized versions that were reproduced from original copies submitted to the Geography and Map Division of the Library of Congress. Some back issues of Metzger and Kroll plat books and maps are available at SAHS and EPL Everett Public Library Northwest Room. SAHS has only a few city directories and phone books. The most complete collection is at Everett Public Library’s Northwest Room, Seattle Public, UW etc plus Ancestry.com and other genealogy websites.